Product Diaries: Pay to promote? 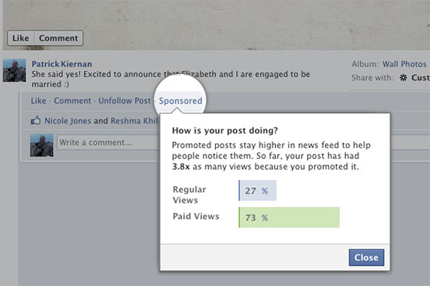 Oct 4, 2012 | Product Diaries: Pay to promote? Fundamentally there are few questions to pose here. Why would Facebook test a global service in New Zealand? They claim it’s because people speak English there and because it isn’t as interconnected with the rest of the world. Is that a solid reason? If you’re the product manager in charge of this feature, what assumptions have you made about individuals vs. businesses? Let’s say we can say with high confidence that there are 500 million daily active Facebook users – that is, users who log in on a daily basis. What sort of back-of-the-envelope calculations can you make about how much money this feature would potentially bring in, as opposed to, for example, Facebook Gifts, which rolled out just weeks before? If you were in charge of this feature, would you take it into the mobile space? Why or why not? Where does the $7 price point come from? Clearly they considered something cheaper early on, so somewhere, someone decided that $2 was not enough. It certainly does say something about the ways in which Facebook is trying to increase its revenue. Whether or not it’s a sticky solution is something that might be better debated over coffee, however! This entry was posted on Thursday, October 4th, 2012 at 3:02 am, EST under the category of Articles, Coding. You can leave a response, or trackback from your own site.